In the heartland of America resides one of the most inspiring zoological displays to be found anywhere: The Henry Doorly Zoo. Impassioned and empathetic admirers of the natural world are privileged here with stunning displays of a caliber found only in traveling the world if not one's very dreams. Under the gifted and creative tutelage of Dr. Lee Simmons, director of the zoo, fantastic aquatic and terrestrial exhibits develop quickly from concept to reality. As a well-traveled apprentice to life, I have toured a great many zoological collections and found one of the unfortunate realities in the administration of such organizations to be an encumbered decision making process. The para-political powers of some organizations necessarily must answer to boards and committees ad nauseam and to the extent that development of new exhibits and the very improvement of others is a remarkably long process. The speed with which work is apparently done instead at the H. Doorly Zoo is not only a model of administration for other zoos and aquariums, but very promising to see for the animals in their charge. On your first trip to Omaha, Nebraska you might expect to find vast fields of corn and soybean'¦ perhaps an overwhelming presence of fanatical collegiate football fans. Well, you won't be disappointed! It seems that there are two types of people in Omaha: Cornhusker fans and out-of-towners. Underneath those layers of loyal red clothing, more importantly, are a kind-hearted people that are quick to show their courtesy and love for life at large. In evidence, the zoo's support from the local community is impressive both in funding and attendance. The first thing you will notice on approach to the zoo is the new keystone of the organization'¦ and what a megalith of a keystone it is! The Desert Dome is the world's largest, glazed geodesic structure and houses a myriad of exotic and uniquely exhibited plants and animals. It is a multilevel facility that shines with the first phase of construction, an above ground desert ecosystem, completed early in 2002. Breathtaking is surely the first impression made upon most folks entering the engineering marvel. The peak of the dome stands more than 100 feet from the ground and dwarfs the 40-foot tall palm trees in residence. The first turn of a tour places you at the foot of a tremendous dune of glorious red sand'¦ a towering facade at 2000 tons (11 train rail cars!). Here, guests are introduced to the Namibian desert of Africa. Rare plants and fascinating graphics depict the quietly dynamic biotope of the region and satisfy a curious mind. Distracted patrons instead can marvel at the free-flying owls unabashedly comfortable with their guests and admiration of the flight. In the Dome, you are taken on a journey of twists and turns through ravines in sheer rock cliffs with exhibits and surprises of many desert regions around every bend. In the Dome, animals are marvelously displayed on the very rock cliffs and terrains that you might naturally find them on in the wild'¦ if you had the toes of a Klipspringer (Afrikaans for 'rock jumper') or the agile physique of a mountain lion. Several exhibits present a thought-provoking juxtaposition of predator and prey in close, but strategically safe, proximity to one another. One can't help but wonder if the magnificent howl of the big cats is but a natural inter-specific vocalization or a warning to the savory peccaries below! Yet, you should not expect to only find popular and traditionally represented species here; the Doorly Zoo seems to take great pride in bringing some of the most rare and unusual specimens of plant and animal from around the world into their program. Even savvy naturalists will be delighted to find species for which they have never before heard or even dreamed of. Have you ever met the amazing felid Caracal, for example? It is a striking cat with one of the fastest known reflexes in the animal kingdom. To see this regal feline bat a ball between its paws in a literal blur is but magic. Make no mistake, however, the furry mammals do not own the desert; fascinating birds, reptiles and even fishes find equal representation here. Walking along the edge of pools with endangered pupfishes, you quickly find yourself lost in wonder at the remarkable collection of hummingbirds. Their flight, and fancy are every bit as mesmerizing as the gorgeous foliage proffered to them for food and roost. Nobly watching all from upon high is a distinguished colony of hawks that reservedly permit an up-close examination of their full regalia. 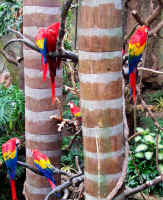 These are but few of the avian delights that grace the Dome and are fully appropriate for a zoo that also boasts one of the largest outdoor free-flight aviaries in the world'¦ if you can pry yourself away form the Desert Dome long enough to enjoy it! After stimulating your mind and senses above ground in the shadow of giant aloe and mesquite trees, and cacti as tall as a house, its time to acquaint yourself with the denizens of the dark below. 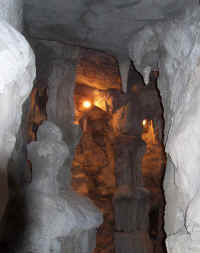 Scheduled for April 2003 completion, the Kingdoms of the Night is a subterranean exhibition of nocturnal and twilight specimens below the Dome not likely to be found elsewhere in the world with such vision. My sneak peak has piqued my interest for an anticipated return to a fantastic zoo and hospitable town. The creative design is a wondrous maze of winding paths channeling visitors from rooms and caverns into bottlenecked passages and comfortable corridors with living biotope nooks at every turn. One of the most dynamic aspects of the exhibition is a suddenly expansive cavern with a hollow spire reaching over 100 foot high. And you must remember that this is all below the Dome; the inside of the cavern is the outside of a tremendous rock peak above ground in the desert displays. It is a very ingenious design for displays and traffic flow throughout the entire facility. The subterranean twilight environment will be illuminated at night so that guests of the zoo by day can observe the nocturnal animal's natural 'night-time' activities in the dimly lit recesses of this magnificent underworld. Floating footbridges over lagoons with live alligators, bat and beaver dens with glass cut-aways and dripping stalactites abound'¦ all looking like something out of a Tolkien fantasy. Welcome to the Kingdoms of the Night. It is no exaggeration to say that this is one of the few zoos that you could take two days as a casual tourist to pass through entirely. And for the more specialized naturalist, there are features and facilities emphasizing most every discipline of popular interest. A new primate complex will soon claim a home colony of about 25 endangered gorillas. Other fascinating primates are displayed on spacious island colonies throughout a large koi and waterfowl pond. Wolves, bald eagles, white Bengal tigers and penguins from the tropics to the 'Pole all grace the collection at large. As an avid aquarist and author on coral reef aquarium science, I can say that I was delighted to explore the 1.2 million gallon Scott's Kingdom of the Seas aquarium. With the exception of one Amazonian display of mammoth fishes, the aquarium is a tribute to the amazing creatures found in the salted seas. One of the first exhibits you will see is a natural display replicating the diversity of a Sulawasi, Indonesian reef. The first thing that strikes any visitor about this unique display is that it is a rare, black sand exhibit. Very remarkable in its presentation, the layout of the aquarium is a low and wide lagoon with surging water flow, mangroves and floating coconuts and palm fronds for a most natural impression! Conducted by skilled lead aquarist, Mitch Carl, the system thrives with teeming life as testimony in every nook and crevice right up to the waters edge. 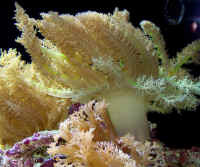 Uncommon corals have spawned in this exhibit, including Euphyllia glabrescens (torch coral) and Pocillopora damicornis (stony bush coral) with planulae settling throughout the display. Entacmea quadricolor (the bubble-tipped anemone) have claimed an entire boomy and cloned themselves into a dominating crowd of cnidarian defense. This feat of natural propagation occurs right before the eyes of the public and is bejeweled by a magnificent colony of Amphiprion melanopus, Cinnamon clownfishes. The aquarium also houses a cryptic Moon Jellyfish display and breeding program where visitors can spy the baby jellyfish (medusae) right on the glass before their eyes. Do I need to further illustrate the desirability of this amazing zoo as a destination by telling you about the 50-foot indoor waterfall in the rainforest exhibit? Perhaps I'll just let you discover this tropical realm that is so realistic with calling monkeys, swooping birds and the threat of rain indoors for the remarkable hygrometry all for yourself. You can take the tour for yourself along dirt paths, bamboo bridges and stony overlooks'¦ or you can spy them from the glass balcony of a climate-controlled restaurant on premise. After a long trek through this incredible zoo, the vegetarian appetite will not be disappointed here in the breadbasket of America, and the leaning carnivores will have not have to search far to discover the basis for legendary Omaha steaks. Visit the Henry Doorly Zoo in Omaha, Nebraska'¦ photograph, learn, create some wonderful memories, and carry on gently in this beautiful world.